* What is Chi Formula? The key ingredient of Chi Formula is Siberian Ginseng. Siberian Ginseng is principally found growing along the banks of the Heilongjiang River, which runs along the Sino-Russian border, and also grows in Siberia and in Hokkaido, Japan. * Why Use Chi Formula? Today, our health is being jeopardized by many things and in many ways. Cramped and crowded living and working conditions, a deteriorating environment, stress from the fast pace and the many demands of life, our poor dietary habits and lack of exercise are just a few of the assaults on our bodies. * Our new Chi Formula takes traditional Chinese medicine a step further. It provides a perfect combination of health maintenance as well as therapy --- destroying and purging you of the things threatening your health and then bestowing on you great energy and vitality leading to more radiant beauty. Anticipate your internal organs regaining their function without any side effects even after prolonged use. increase stamina the body’s staying power 16.3%. 3. 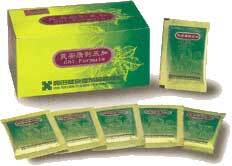 Helps the internal organs to return to normal function without side effects even after prolonged use. 4. Increases metabolism and reduces fatigue.